We have been very busy here at the Quill gearing up for the fall season, but that’s what happens around this time of year. With so many book launches, award submissions, and production deadlines all at once it tends to get a little hectic! As all you social-media-savvy kids already know, PQL has been busy printing up at the shop in Erin. We launch an issue of the Devil’s Artisan every year at Wayzgoose, and this year the date coincided with the deadline for our fall catalogues; there was a lot of printing to be done in the weeks before the end of April! While April was busy, May is promising to be plenty of fun. We’ve got an event coming up in city and some announcements for events in the not-too-distant future. In Toronto. The Porcupine’s Quill is participating in the Toronto Comic Arts Festival, being held at the Toronto Reference Library on Yonge Street. At the festival this year you will find Marta Chudolinska (Back+Forth), Stefan Berg (Let That Bad Air Out), and George A. Walker (The Mysterious Death of Tom Thomson, and many others). Feel free to drop by our table and say hello! In the not-too distant future. We’re proud to announce that we have two events at the Kingston WritersFest this year. Please join us in Kingston at the end of September for the launch of The Essential Tom Marshall and an illustrated talk by George A. Walker. The launch of Tom Marshall in Kingston is particularly apt as it was this great Canadian poet’s home for most of his life. Friends of the late Marshall will participate in the launch, with readings by Michael Ondaatje, David Helwig, Carolyn Smart, Steven Heighton, Diane Schoemperlen, and Eric Folsom. Later in the weekend, George A. Walker will present an illustrated talk on The Mysterious Death of Tom Thomson, discussing his personal interest in its subject matter, the graphic novel in general, and the future of the book. 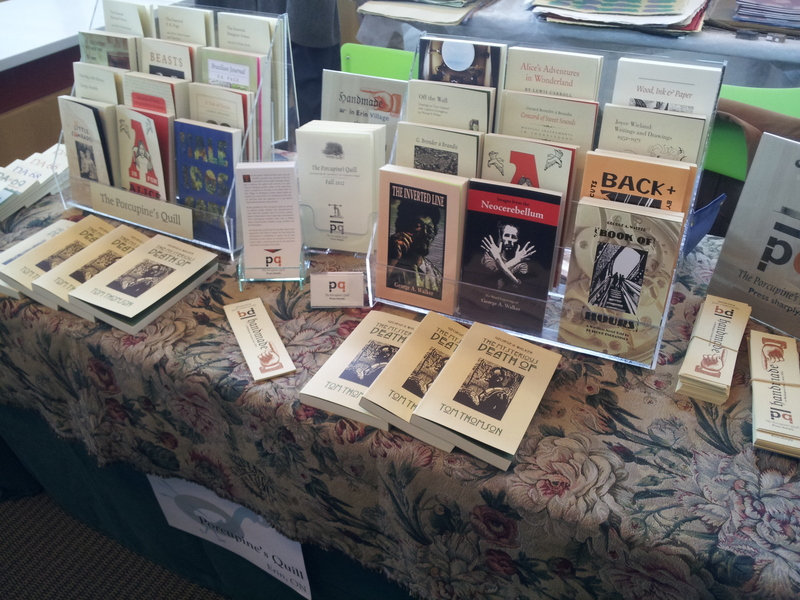 Our table at the Grimsby Wayzgoose, launching DA 70 and The Mysterious Death of Tom Thomson. While things have been busy up in Erin, I’ve been busy here in the city too. We’ve just uploaded our Fall 2012 titles on the website, and there was much fussing with website copy and coding. But May is looking like it will also have plenty in store. At the moment I’m gearing up to begin another round of grant applications. 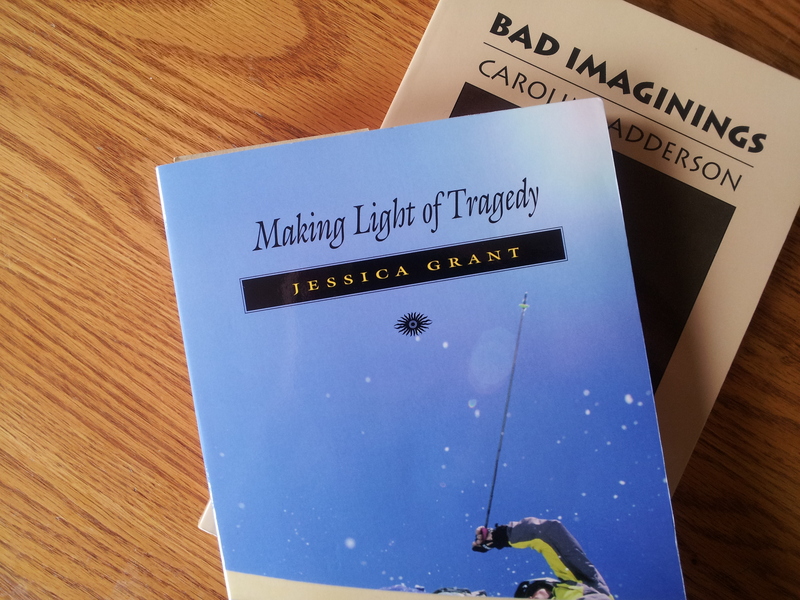 I’m also working on the next review blog, this time (hopefully) on Jessica Grant’s Making Light of Tragedy and Caroline Adderson’s Bad Imaginings. For all my PQL friends out there, if you have any thoughts to share on these short story collections, any topics you’d like to see covered, feel free to drop me a line or comment on this post. Oh the life of an intern! But by far the biggest highlight to report is my brief foray into bookmaking. On my last visit to Erin I helped bindery assistant Jessalyn Forsythe hand-tip endleaves into the issues of the Devil’s Artisan. Though I acquired many paper cuts in the process (and had to be patched up with a Spider Man band-aid), it was definitely one of my finest moments in publishing so far! The next blog may feature Making Light of Tragedy and Bad Imaginings. This entry was posted in Letters from the Porcupette (the Intern's Blog) and tagged Back+Forth, George A Walker, Let That Bad Air Out, Marta Chudolinska, Stefan Berg, TCAF, The Essential Tom Marshall, The Mysterious Death of Tom Thomson, Toronto Comic Arts Festival. Bookmark the permalink.